I may live in sunny California, but I haven’t forgotten what it was like to grow up in New Jersey, where winter often dragged on well into March … and sometimes into April. Oh, how I longed for summer and its hot days filled with the lazy rattle of cicadas and balmy nights spent sipping cocktails under a canopy of stars. My dad would take the lawn furniture out of hibernation around the time the cherry blossoms bloomed, giving it a good cleaning in time for the first marginally warm day, when we would bundle up under blankets with a good book and an iced tea as an early celebration of summer’s return. Here in California, winters may be shorter and milder, but I still look forward to bringing the cushions out of storage to be enjoyed well into fall. I also love the way my new state’s warmer, drier climate lends itself to more modern, spa-like exteriors, taking inspiration from Palm Springs and the tech-influenced modernism cropping up all over San Francisco. With that in mind, here are eight elegant modern chaise longues (sometimes called chaise lounges) for your summer daydreams. Who needs a man cave when you can watch the game from a partially submerged lounger? 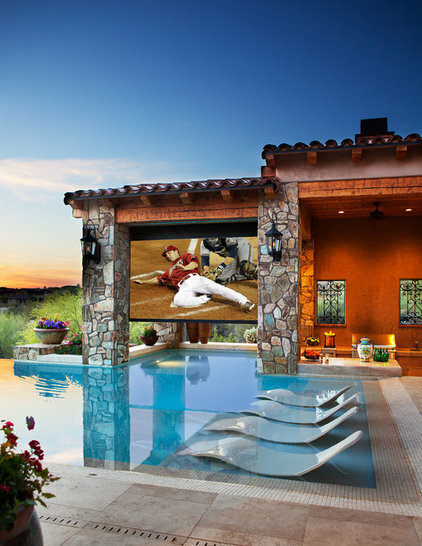 Beringer Fine Homes created this dive-in movie theater in Scottsdale, Arizona, by pairing water loungers with a drop-down projection screen. The kicker: The screen retracts and is replaced by a waterfall when the projector is not in use. 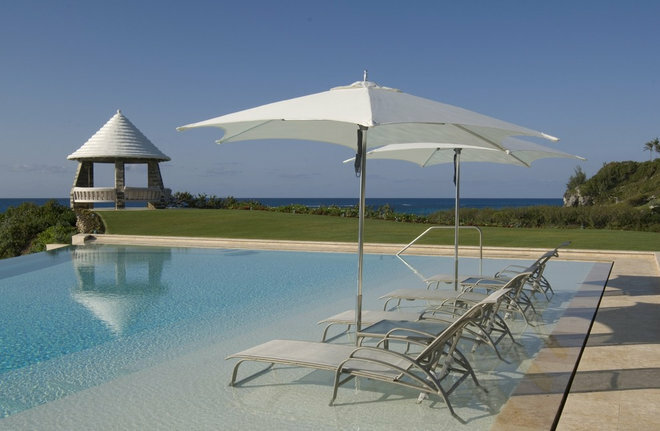 Placed on a sunning ledge, these Ledge Loungers and matching umbrellas create a beachy feeling reminiscent of an incoming tide. Be careful if you want to replicate this idea; placing any old lounge chair in your pool will result in a rusty mess. Ledge Loungers are specially treated so they will not be affected by chlorine and other pool chemicals. 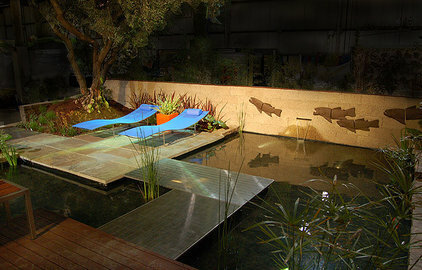 A pair of cerulean lounges from Henry Hall appears to hover over this garden, which incorporates walkways over water leading to a destination patio. This garden draws heavily on minimalism’s foundation in Japanese design. Put simply, it’s about adding what’s needed and subtracting the rest while also incorporating Zen elements like water, rocks and plants. 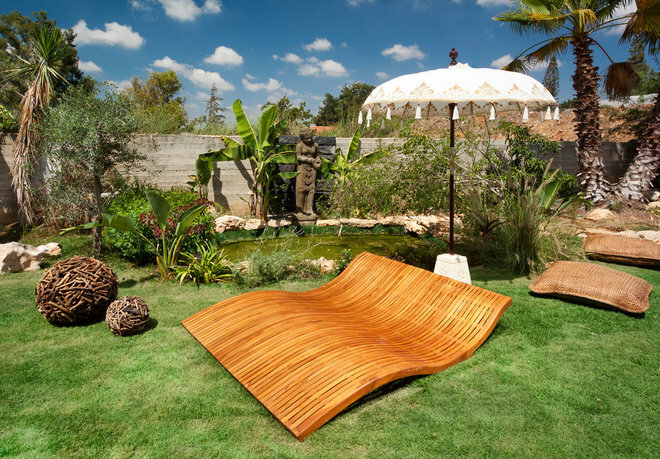 A wave-style double chaise anchors this eclectic outdoor space, serving as equal parts lounge apparatus and art piece (similar to this one), while eclectic Southeast Asian accents keep the space feeling relaxed and informal. We’re daydreaming about hosting a summertime white party on this deck in the Los Angeles hills. Square daybeds are ideal for entertaining, providing space for daytime sunning as well as communal seating for an evening soiree. This pool, by Bradford Products, includes a built-in chaise to make the most of a small space. 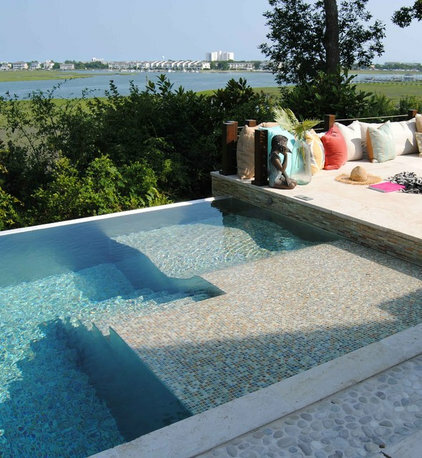 The pool is finished in glass mosaic tile, so it’s smooth to sit on and won’t snag swimsuits. Working with a smaller urban space? Lounges with slings — like these from Kingsley Bate — marry comfort and clean lines without dominating the space. Purple double chaises add a pop of color to this minimalist space in Menlo Park, California. I love how their rounded edges break up the clean lines, adding interest and flow.